A few months back I received a Summer Beauty VoxBox full of great goodies! If you haven't head of VoxBoxes, they are given out via Influenster. They a company describes their services as a "Community of trendsetters invited to share their lifestyles and show off their influence to qualify for personalized product shipments, special rewards and exclusive deals from the brands they love. Members love testing the latest products, giving insightful feedback, and spreading the word on their favorite finds!" If you haven't yet, sign up with them! Now onto the goods! It took me so long to do this review because I wanted to test each product. Hawaiian Tropic Silk Hydration Lotion Sunscreen SPF 30: I am the worst at remembering to use sunscreen! When I finally remembered, I put this on and what do ya know? I didn't burn! I used it this weekend and was in the sun for several hours and am happy to report my skin is not red! Tampax and Always Radiant Collection: We all gotta use these products and we may not talk about them but since they were in my box, let's get to it. I actually enjoyed both products. So much so that I went and bought these products at the drug store. I highly recommend them. Quaker Soft Bar in Banana Nut Bread: This bar is perfect for those on the go. I took mine to work and heated it up to enjoy it. Unfortunately, I am not a fan of nuts and there were a lot of them on the treat so I didn't enjoy it as much as I would have without them. If you like nuts, try this out. I think you'll like it. Sally Hansen Nail Color: Was obsessed with this polish upon applying but quickly fell out of love. You apply the polish then use a magnet to create a cool, random design. Totally awesome and 3D-looking. Unfortunately the polish chips quickly and badly. Sally Hansen Nails and Cuticles Hand Creme: I tried this out, but I have weird issues with not being able to have lotion on my hands. It smells good and made my hands soft but I just can't use hand lotion. I'll probably give it to someone who will be able to enjoy it. All in all, I really liked this box! I hope I get to participate in the upcoming boxes. It was like the other boxes that you pay for...except free and with better contents! 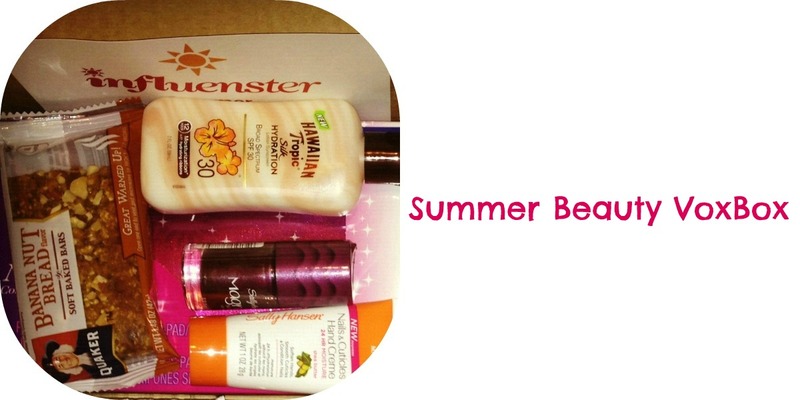 Did you get a Summer VoxBox or have you tried any of these items? This is a great box. I like how there is all sorts of different products in it you would use in your everyday life. Wait, how is it free? I'm so curious! I just tried birchbox, and it was fun, but not nearly as cool as that box. Wait, wait. The tampons are called "always radiant"? I'm totally sold. Oh my, I totally need to review the box as well ... I knew I've been forgetting to do something, thanks for reminding me! The sunscreen was by far my favorite product, probably because of my fair skin! I had the same opinion about the magnetic nail polish! I'm so glad I didn't go out and buy it and got to try it. It was a dud for sure. Good stuff! That bar looks good, and I love nuts, but not banana bread. Hahah! Did the sunscreen smell good? I'm with you on lotion. I only wear it at night because I don't like the feeling of it. I need it though. My hands are always dry.